"This is the witching hour! It is an hour when dogs howl, and evil things are let loose on a sleeping world. Want to hear about it? Then turn out your lights!" The villainous vocal skill of Boris Karloff, Mercedes McCambridge, Willard Waterman, Shirley Mitchell, and more bring to life twenty perilous plots. They will tell you strange secrets of the supernatural, of science experiments gone wrong. They will find themselves surrounded by frightening creatures, by ghosts (and ghastly sound effects). They will commit cold blooded murders that will make your own blood run cold. "If you wish to avoid the excitement and tension of these imaginative plays�we urge you calmly�but sincerely�to turn off your radio�now." 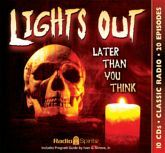 Lights out�everybody! Includes twenty digitally restored and remastered episodes, and a Program Guide by Ivan G. Shreve, Jr.